My almost-seven-year-old grandson recently learned to do cartwheels - he has such joy when he is "cartwheeling" across the yard! Joy, absolute joy! 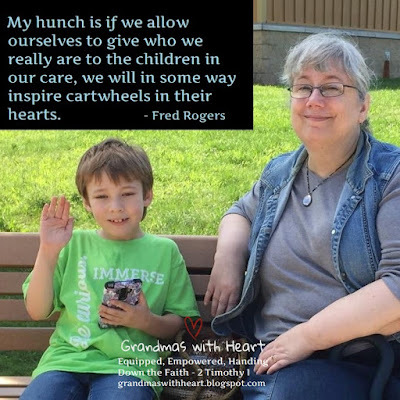 So, when I read this quote from Mr. Rogers about inspiring cartwheels in my grandson's hearts, I have a very definite picture of what this looks like! I want to inspire joyful cartwheels in my grandsons' hearts and believe I am able to do so by praying for and with them, encouraging them, laughing with them, playing with them - by loving them with my all. On Children's Day we had dinner at my house and my grandsons were able to sit and listen as their parents and grandparents took turns sharing what they love so much about each of them. Their eyes twinkled, they had the biggest smiles on their faces as they listened to the four adults who most influence them tell why they loved them. They had "cartwheels in their hearts". As the Summer begins and you spend time with your grandchildren in the coming months, or connect on-line if they live far, be sure to take advantage of opportunities to inspire those "cartwheels" in their hearts with those which just come along as well as times you plan. This is part of what it looks like to hand down the faith and it matters!